A best-seller! Assam tea is famous for its lush flavor, amber color, and a smooth, multi-layered “malty” flavor. We have chosen a traditional, orthodox full leaf Assam, which makes for the perfect breakfast tea. Our Assam grows in NE India, where low, rolling hills creating a great environment for rich tea. Hot days and cool nights bring out the fullest flavor! This is an EXCELLENT Assam tea. It is surprising to me at how good it really is – given that it is a bagged tea. 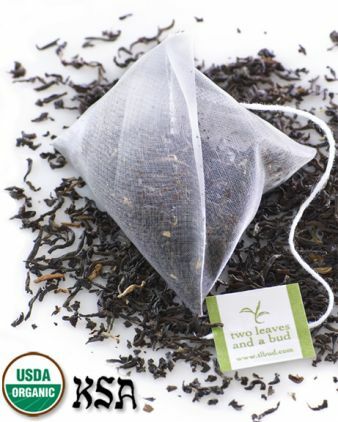 If nothing else – this tea is proof that a superior quality leaf can be found in bagged form! Sometimes, you just have to look for it. Well, you needn’t look any further … because I have found it! It is a full-bodied tea – with a nice texture that is almost “chewy.” This chewiness is further enhanced with the noteworthy maltiness in this Assam – most Assam teas have a malty note to them; with some Assam teas the malty note is quite delicate while in others it is very strong. Here, it is very strong. And while it does possess that stout, robust, get-up-and-go quality that the best Assam teas have, it also has a very pleasant smoothness and an almost caramel-y sweetness that hits at the end of the sip. This is a very delightful cup of Assam tea! While the suggested brewing parameters for this tea are 5 minutes – I only steeped this cup for 2 ½ minutes. The result is a full-flavored, malty cup of Assam without any bitterness and minimal astringency. I fear that brewing it for a full 5 minutes may result in a slightly bitter cup, this stemming from my knowledge and history in working with Assam teas, but not from my specific knowledge and/or history with this particular Assam. So feel free to experiment and find what works best for you. I highly recommend this Assam tea to all tea lovers, especially to those who have a fondness for Assam tea. You may just find a new favorite with this one! Yes, it really is that good!